On July 4, 2014, my wife and I visited our neighbor and friend Debbie Theis at Jefferson Hospital in Philadelphia. She was recovering from brain surgery, having had most but not all of a malignant tumor removed. It was the fingernails of her folded hands that caught my attention. 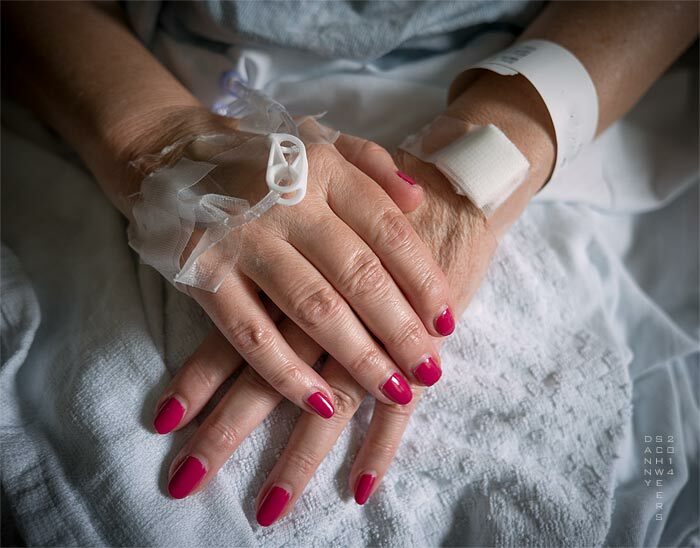 They were painted a vivid red, so at odds with the clinical white of her hospital gown, the ID bracelet on her wrist, the gauze and the heparin lock. As a photographer, I immediately wanted to make a photograph. I had my camera with me. I often have it with me because I never know when something photogenic is going to appear even in the most unlikely places, something transient and fleeting but worth fixing in place before it disappears. Eventually I worked my nerve up to ask Debbie if I could take a picture. I took several while she joked about a future career in modeling, not soap commercials, but jewelry, and she’d get to keep the pieces of jewelry she modeled. This is not her wedding day. but it’s cotton and open at the back. an ID bracelet around her wrist. Even so, her nails are painted a festive red. she just might live forever. Debbie didn’t live forever, not in this world. The next fifteen months saw her gradual decline and death. During that time, I saw her often. On Sunday mornings she would sit next to me in church, saying how she imagined people were talking about us as a couple because our spouses were not sitting with us. On Wednesdays, we would go to the noon service of healing prayers. We prayed. Many prayed. Prayer doesn’t stop people from dying any more than does red fingernail polish. But prayer does sustain people, and I think it sustained Debbie, sustained her in much the same way that the nail polish did, as a way of saying there is a place in life for affirmation, that we can have elegance, style, faith, and humor no matter what life throws at us. Debbie loved singing in church. Even after she had to leave the choir, she always tried to sing the hymns and gospel tunes during Sunday service. Towards the end, she could not follow the service, could not find the hymn numbers, could not follow the lines even after I found the hymn for her. Yet still she loved participating. She loved being a part of it regardless of how little she had to offer. She loved being part of the elegant Episcopal liturgy, part of the sung praise to God, part of a loving congregation, part of a long history of people affirming life, who say the future is bright, who say we will be reborn, who say there is life to be lived here and now and in the world to come. The last time I saw Deb, the day before she died, she was sleeping peacefully. Some say she looked angelic, even radiant. Her fingernails were polished. As noted above, the photo of Debbie’s folded hands was first seen in Photo Prayer 2014-28. 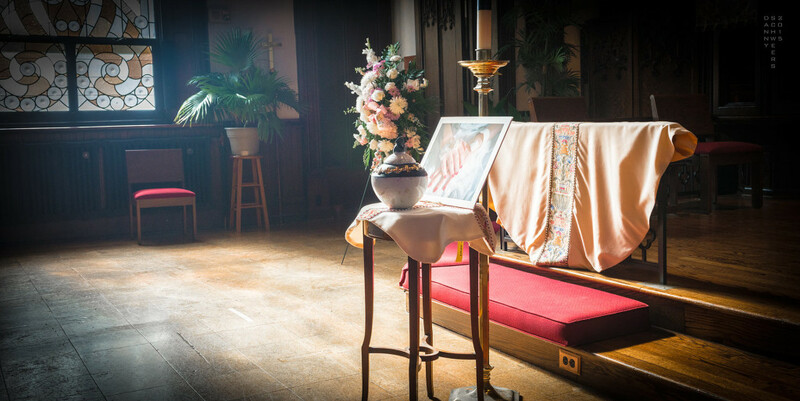 Then, at her funeral service on October 23, 2015 at the Episcopal Church of Saints Andrew & Matthew, Wilmington, DE, an 11×14 print of the image stood behind the urn containing her ashes. Above is a photo from that funeral service. Click on it to see it larger in a new window. While she was still living, I submitted this photo and nine others to the Texas Photographic Society for its 28th Members’ Only Show. This photo was chosen. In choosing work, the juror — Keith Carter — stated that he was looking for images that were moments of revelation, when the world is at once mysterious and crystal clear. Click here to see the 50 images by 50 photographers selected for this exhibition. The photos hung at the Tammy Cromer-Campbell Photo Gallery in Longview, Texas, from December 10, 2015, through March 18, 2016.